Take your shoes off at the door, please. I could blame my need to be shoe-free on my OCD tendencies. I’m certain they are largely responsible. But you could also blame it on a trip to Japan some years back or the influence of my shoe-free sister who has lived throughout Asia for many years. Or you could blame it on the fact that I used to live in one of the dirtiest cities in America. If you have ever stepped foot in San Francisco, you know what I’m talkin’ about. The streets of San Francisco might be beautifully breathtaking but if you ever look down (no, don’t look!) you will find yourself walking in a cesspool of trash and human waste. So when I was living in a downtown SF apartment with WHITE WOOL CARPET (I know, what the hell was our landlord thinking?!? ), I finally put my foot down to wearing shoes indoors. It’s not easy being shoe-free but I do try to make it easy for my guests. When we moved to our new house last year, I made a nice take-off-your-shoes area. I have a leather bench in my entrance hall where people can sit comfortably and remove their shoes. I also have a basket of clean socks and slippers for people to use, and I clean my hardwood floors daily (please don’t say it). I even have over-the-shoe booties for workers or for people that choose not to remove the shoes. Yes, I really am that crazy. Still, some people complain about it, most notably *ahem* certain husbands. The Dude is definitely not happy about the rule, only because he claims that it’s hard to put his shoes on every morning in the garage. I get that that. We have a shelf for all the shoes near the garage door, but no place to sit. It’s easier for me since I don’t usually wear shoes with laces. I’m sure that the Monkey will complain about it, too (as well as all his friends) but to all of them I say this: when you clean my house to my ridiculously high OCD expectations that no housekeeper has ever lived up to and why I clean the whole house by myself, then you get to make the rules. Until then, Mama rules this shoe-free roost. Do you have have a no-shoe policy, too, or are you like The Dude who thinks it’s ridiculous? I’d love to hear from you. I can understand the rule in your situation…but I’m kinda’ laid back I guess…plus I don’t have a white rug! Just stopped by to say hi; hope you’ll do the same! I can relate! I also hate shoes in the house. I have 3 kids and they have all learned to take off their shoes when they come inside. When they started bringing friends over to play I was surprised to learn that many of them have the same house rules. You’re not alone! I can so relate. We’re shoe free people, too. 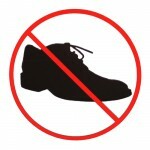 Shoes are allowed on the hardwoods or in the kitchen. No where else, though. Found your from SITS! I also have that rule. I have light carpet everywhere and it’s so hard to keep it clean when you have kids tracking in mud and dirt! I have a strict No shoes policy in my house for various reasons. I too have light carpet courtesy of a really stupid landlord. I would like to go on record and say this: I HATE CARPET. I think it should be against the law. I despise it and there is nothing good about it. If the day comes that this recession ever ends and we get to buy a house before we are 98 years old I will rip every thread of carpet out of it before I set foot in the door. No one wears shoes in the house so why do I have to clean my carpets every 3 months? Oh and let me say it is not because I am OCD super housewife (anyone who reads us knows I am not anywhere near that) it is because my carpets are genuinely freakin NASTY!!! WTF? It is a total mystery to me. Why would anyone WANT to wear shoes inside anyway?!? We don’t have a strict policy, but everyone typically takes their shoes off at the door. I tend to slide into a pair of Birks that I’ve designated “house birks.” It’s more for comfort than for cleanliness, but I will say that it always seems that when someone walks up the stairs with shoes on, not only do I see the tread tracks, they inevitably leave dirt. “No shoes” is a great policy! Now, if I could just get the twin border collies to wipe their feet before they come in, quit dragging stuff in from outside, and quit shedding, my house might come close to being in some cleanliness range that is at least somewhat remotely near Aimee’s on the scale. Oh, and Aimee, if the Dude complains too much, remind him that you’re not the only OCD-er in your home. No need to apologize…..We’re a shoe free house with the exception of when we have large parties (a lot of older folks can’t or won’t walk about sans shoes) Then, we roll up all of our wool rugs, and store them away until the party ends, and until we can clean the floors thoroughly. Most of the world’s population is shoe-free. It’s really “western” cultures that wear the same shoes that have tread on spit, dog dirt, and worse into their living environment. I’ve have toddlers crawling on the floors, and want a certain level of cleanliness. I also like to sit on the rugs, too for exercise, puzzles and play. Our dog knows to sit upon entering the house in order for us to wipe his paws. We keep a baby wipes container filled with damp paper towels in our entryway just for that purpose! After reading all the posts up to this point I have to comment! I hate wearing shoes in the house! The kids and I kick them off at any opportunity! However, we all forget to put them back on to go outside. So I guess that defeats the purpose! We have the dirtiest feet in the summer… so gross! So what do you wear to run outside for a quick second? I am very grateful I don’t have an OCD bone in my body! I love your blog, by the way! I hope you get back to it soon.